Retail $29.00 SAVE 37% ! 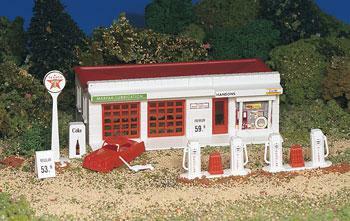 Easy to assemble building kit for use with HO scale layouts. Snap-fit assembly (no glue necessary). Pre-colored plastic parts (white outside walls, red roof, red window grids, red car, white pumps). "Good for some places with some changes"
Under the long-running Plasticville name, Bachmann makes several kits of mass-produced buildings common in the railroad transition era, the 1940&apos;s and 50&apos;s. These are not craftsman kits, but used in the right way are an economical and quick way to set the stage for those who focus on right-of-way and trains. The kits are sturdy and simple, appropriate for young modelers. Many of the detail elements are a bit clunky and out of scale. Doors, for example, often measure a scale 4 feet by 9 feet, rather than a more realistic 3 feet by 7 feet. Orienting buildings with oversize doors on less visible sides is one option. Window mullions and muntins (the elements that divide glazing into sections) are too thick. They can be carefully filed to thinner profiles. With some adjustments and paint, this kit can become a convincing component in a group of commercial buildings. Addition of the car jack detail and the car is interesting. If you have more sophisticated vehicle models, you may want to use the one in the kit --it lacks glazing and trim and wheel detail-- as a wreck. Dent the fenders with some heat. Spray or rub on some rust pigment. Put it behind the building. I&apos;m using this building next to a repainted Atlas Roadside Restaurant and a modified Plasticville Gas Station to fill foreground space in a 1950&apos;s San Fernando Valley, through which more attractively designed Lark and Daylight trains run on their way to more pleasing scenery in the Santa Susanna Mountains and along the coast.